A nursing supervisor at a community hospital is a pivotal role that requires the ability to prioritize, be responsive and be a clinical resource in an environment that can change rapidly. On any shift, your leadership role becomes the standard role model. Are you ready to take on leadership responsibility and need flexibility? Then it's time to do it the Franklin Way. Together we deliver a higher state of caring! Scope of your work is varied. Responsible for the safe and effective management of patient care. The supervisor is responsible for translating the philosophy, objectives, policies and procedures of the hospital and inpatient services. Coordinate patient care activities across all units/departments for a designated shift. Massachusetts RN license, CPR and ACLS. Violence Prevention program, training provided. Associates or Diploma of nursing. 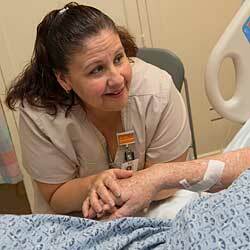 Bachelor of Science in Nursing preferred. Minimum of four (4) years of clinical experience as an RN. Minimum of two (2) years of supervisory/ management experience required. Consistently positive performance appraisals in key areas: patient/customer service skills; communication, interpersonal relationship building; conflict management. To be a role model supporting operating principles. This is a per diem position, nights, weekends and holiday's located in Greenfield, MA. Candidate must be able to attend day time orientation in Holyoke and Springfield, MA.